Hanging out is a term associated with going out, likely to a bar with a group of friends and having a good time talking, laughing and having fun. This easy, fun going, and pleasant environment is what we like recreating in our open space kitchens when we have family and friends over. And let them gather with us as we cook and prepare a meal and share drinks. A key piece of furniture required to recreate this environment is the bar stool. It has become ubiquitous in most modern homes. An essential piece of the jigsaw when creating a social environment in the kitchen and living space. 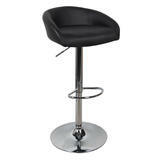 The bar stool is designed to be used near an elevated edge or a high table. Choosing the right bar stool requires that you know what style and color will complement the colors already existing with the kitchen space. It also requires that you be aware if adults, children or the elderly are expected to use the bar stools. Due to the fact that children and the elderly will prefer bar stools with a backrest. Another key component of a bar stool is the leg rest. Most people are uncomfortable sitting down for long periods of time without a support for their legs. The other major consideration for selecting a bar stool is the height of the raised edge which it will be used with. 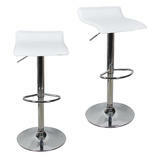 Using bar stools with adjustable heights removes the issue of conflicting height requirements. This is very important for those who move homes, as it ensures you do not end up with a bar stool that is unusable in the new home. What really complements the comfort and utility of a cool bar stool, is getting a good deal on them. And 123ink.ca is giving very good deals on several of their bar stools in early black Friday sale. The Adjustable Height Swivel Bar Stool, Contemporary Style from Moustache®. Apart from coming with the essential footrest and back support, it also comes with a chrome plated frame that complements most indoor environments and is finished in PU leather. It is going for the giveaway price of $39.99 for the 1pack – black color, $59.99 for the 1pack – white color, $78.99 for the 2pack – black color and $99.99 for the 2pack – white color. And you get free shipping for these products for all deliveries within Canada. 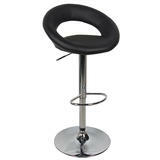 Another good deal can be found on the Swivel Adjustable PVC Bar Stool from Moustache®. This is a bar stool that always creates a modern trendy look within the home space. It provides comfortable seating with swivel action on a sturdy base. With the early Black Friday sales offer, you get this for $29.99 for the 1pack – black color, $34.99 for the 1pack – white color, $59.98 for the 2pack – black color and $68.99 for the 2pack – white color. And rounding up the deals on the bar stool is the Adjustable Height Swivel Moon Shape Bar Stool from Moustache. This has a modern shape that stylishly adorns the kitchen space. Its frame is chrome plated and rests on a sturdy base. It has a backrest and footrest to cater for tired and aching backs and feet. With the special offer pricing on the early Black Friday sales, you get this for $39.99 for the 1pack – black color, $59.99 for the 1pack – white color, $79.99 for the 2pack – black color and $99.99 for the 2pack – white color. And you also get free shipping for these products for all deliveries within Canada.